Temperatures are getting warmer, and Spring is in the air. The first sign of spring makes homeowners in the northeast eager to get outside to enjoy the fresh air outside. While evening temperatures might not be warm enough to enjoy on your patio quite yet, there is one thing that can help get you outdoors earlier this spring — A firepit. The primary reasons for installing a firepit in your backyard is obvious: Heat. A firepit warms a section of your backyard so you can enjoy your outdoor space before the temperatures allow it. However, an outdoor firepit provides so much more than just heat. It light your backyard long after the sunsets. It provide a gathering space, a place to roast marshmallows and hot dogs. It is a beautiful focal point for your yard. In short, a firepit can add a great deal of value to your outdoor living space for many seasons. 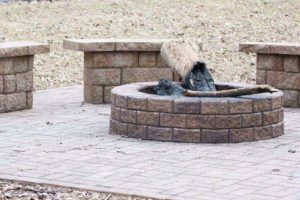 Once you know you want to add a firepit to your yard, you’ll find that there are endless options for outdoor firepits. You’ll have to choose between a wood-burning and a gas-fueled firepit. If you choose a gas-fueled firepit, you have to decide whether to rely on a gas tank for fuel or run a permanent gas line. You can choose between a freestanding firepit that you can transport to different spots around your yard. You can also choose a permanent, built-in firepit structure. There are traditional firepits or sleek, modern firepits that feature contemporary materials, glass stones in lieu of logs or floating flames. You can choose a simple firepit or you can choose a firepit that is built into a table. The options are endless, and the team at Tri-County Hearth & Patio is here to help! Finding the right firepit for your home can be overwhelming, but the outdoor living experts at Tri-County Hearth & Patio is here to help! Our giant showroom is filled with plenty of outdoor firepits. Our experts are here to listen to your needs and wants to help you determine which outdoor firepit is right for your backyard. Once we picked the right firepit for you, our technicians can also install your new firepit in your yard. Stop by the Tri-County Hearth & Patio showroom to shop your new and dream firepit today, so you can get outdoors early this spring to enjoy the fresh air!